Paintings by Julie Roberts (b. 1963, Fflint, Wales) are both realistic and otherworldly, often focusing on the restraint of the human body and the power structure of institutions. Roberts finds inspiration in works by various artists and thinkers, as well as in memories of her own childhood. She cites French philosopher Michel Foucault as a major source of inspiration. Artists Jenny Holzer and Barbara Kruger also influence Roberts’s work, particularly in her exploration of the female body and womanhood. Evidence of the artist’s upbringing is visible in her oeuvre. As a child, Roberts often spent time in a former morgue or at the nursing home where her mother worked. Medical equipment and furniture often appear in her paintings. Roberts’s unsettling works from the 1990s lack figures. 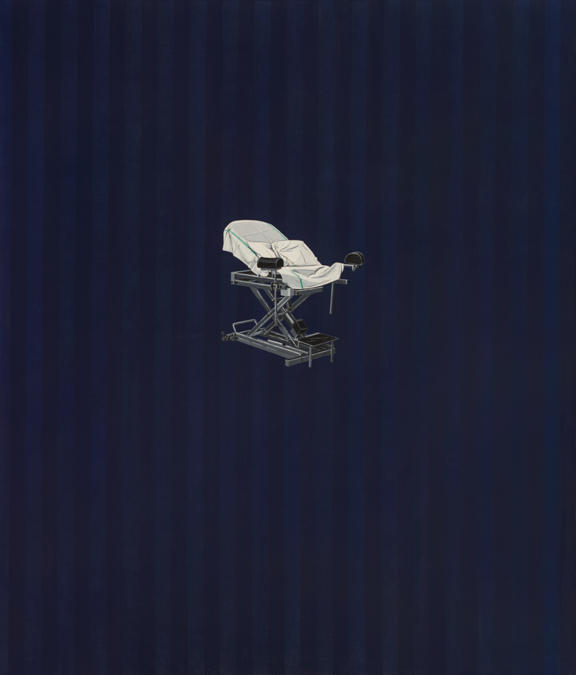 Instead, symbols of institutional management of the body, such as a straightjacket, a gynecological chair, and a nightgown, seem to float in the center of the canvas. Backgrounds containing rich color fields and subtle vertical stripes produce an “optical kind of fizzle.” Roberts’s thickly-painted objects appear in a “frenzy” against the structured and controlled backgrounds. While they suggest the human body, they are never occupied by one. Gynaecology Couch (1992) shows an empty seat with stirrups against a deep blue background. Isolated from figures or other objects, the couch conjures senses of sterilization and solitude often associated with hospital visits. With no light source and no cast shadow, the chair appears surrealistic. Upon closer examination, exquisite details in the couch pillow reveal a deep impression, as if someone was just sitting on it. Without visual context, viewers are left to speculate about the couch’s story and purpose. Roberts’s more recent paintings represent an aesthetic departure from her earlier work. 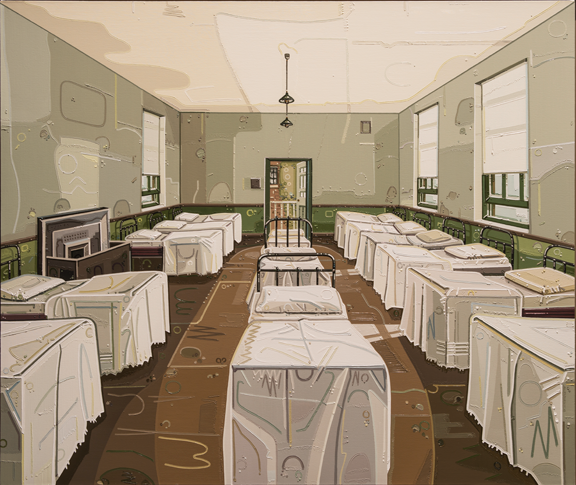 As her practice developed, she “slowly started creeping towards the edge of the canvas.” Dormitory (2011) exemplifies Roberts’s expressive and highly stylized application of paint featuring graphic circles and lines that form distinctive patterns. This painting recalls the exaggerated perspective Surrealists like Giorgio de Chirico used in 20th-century Europe.